The temperature increase of object exposed to solar light is a well known phenomenon. What happens to objects that are equal except that for their colours? 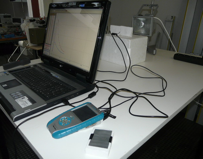 • To analyse different aspects of the radiation absorption from bodies of different colors. •To use experimental evidence to decide on everyday problems. • To design and carry out an experimental investigation by controlling variables. The three home-made radiometers face the halogen lamp at equal distances (25 cm) from the light source (see Fig 4_2a). The lamp is switched on and the radiometers are simultaneously illuminated for 30 seconds, after that the lamp is switched off and removed. Results show the black sensor reaching the higher temperature, the white sensor the lower temperature and the unpainted aluminium sensor an intermediate temperature (see Fig_4_2b). 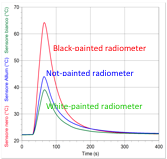 Students assert that the black painted radiometer is the most sensitive to changes on surface temperature induced by the energy transmission of light because it is able to absorb more energy with respect to the white-painted and aluminium sensors, which are both interested by a reflection phenomenon of the incident radiation. • What is the role of the “invisible light”? Results of both previous activities can be discussed by introducing also analogies with the case of warm sensation in proximity of hot objects. Infrared radiation (IR), i.e. the thermal radiation (not visible) emitted by hot objects can be introduced as well as the different times characterizing the transfer of energy by thermal radiation with respect to that with heat exchange by conduction and convection (which both appear to be slower processes).